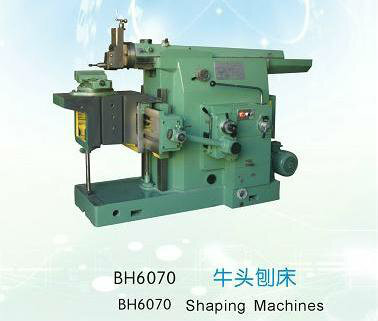 This machine is suitable for shaping plane and formed surfaces. High productivity can be obtained for shaping plane surface, T-slots and dovetail slots, etc, on narrow and long workpieces. The RAM mechanism of this machine adopts the guide unit with torsion-spring internally fixed. During the RAM movement the cutting tool can be adjusted to an arbitrary position. The total closed cam-ratchet unit is employed in the feed mechanism and rapid travel mechanism of the table featuring change of feed amounts without stopping the machine during cutting. A disk-type overload safety unit is used. Owing to the adoption of swivel device with cam-curve groove different speeds can be selected arbitrarily.